This blog supplements the paullewismoney twitter with longer comments, explanations and guides. The purpose of this research is to see if cash or shares give the better return over periods of investment from one to twenty years. Most advisers would agree that over the long-term shares are the better place for money. And most would also agree that over the short-term cash is safer. But where is the time boundary between that advantage of shares over cash? Advisers often call five or ten years ‘long-term’. But there can be substantial risk of losing money over that sort of period. So where is the advantage boundary between cash and shares? This research seeks to set parameters. Read the Press Release which summarizes the findings. Shares are represented by a real FTSE 100 tracker from HSBC. Chosen as a typical tracker – not cheap, not expensive, and accurate. Data from Morningstar. The numbers are the total return with dividends reinvested and after charges. It is assumed that once invested the money is left untouched to the end of the period at which time it is encashed. Cash is represented by best buy one year bank or building society deposit accounts – referred to as ‘one-year bonds’. The data is taken from MoneyFacts Savings Selection and was collected from original copies of the MoneyFacts periodical which is published each month. One year bonds are used in the analysis as what I call ‘active cash’. On each anniversary of the investment the bond is cashed in and then reinvested in the current best buy one-year bond. In the real world there would be a time lag between encashing and having the money available for reinvestment. This point is dealt with later. All datasets are of prices on the first of the month. Morningstar data is for the closing price on the date. It has been normalised to begin at £10,000 in 1 January 1995. MoneyFacts is published once a month and the data is for best buys a few days earlier, just before the start of the month of publication. This slight date difference is considered immaterial. The datasets run for 21 years from 1 January 1995 to 1 January 2016. For each time period of 1 to 20 years within the dataset the growth in cash (as defined) and shares (as defined) was calculated. Let us take a five-year period for example. The calculation is of the growth in the investment over five years from an investment made on the first of a month. So a five-year period runs for example from 1 October 1999 to 1 October 2004. Twenty-one years of data is used from 1 January 1995 to 1 January 2016. Over that period of 21 years there are thus 16x12=192 possible investment periods. It is assumed that the investment is opened on day one and cashed in on the anniversary at the end of the period. For each of the periods the growth is calculated for the tracker and for the cash. The two growth values are compared to see if tracker or cash gives the higher growth over that period. No deduction is made for tax on interest or dividends. That approximation is explained later. For each five-year period the spreadsheet counts the occasions when (a) cash or (b) shares gave higher growth. It also counts those periods in which the money in the tracker ends up less than it started. All calculations and data are nominal – no account is taken of inflation which affects cash and tracker funds equally. Whatever measure of inflation was used it would not affect whether cash or shares gave the higher return. The table shows that for periods starting 1 January 1995 to 1 December 2010 a five-year investment in cash or shares (as defined) started on the first day of a randomly chosen month would yield a better return in cash more often than one in shares. Investing in shares carries another risk – losing money. In 46 out of the 192 five-year periods (24%) the tracker would lose money, ending lower than it started. Cash never loses money within the Financial Services Compensation Scheme limit – currently £75,000. Above that limit there is of course a risk that the savings institution will collapse and some or all of the capital lost. Large sums can be protected if they are spread among several institutions keeping the money in each at £75,000 or below. That will reduce the interest earned as by definition not all can be in the best buy account. But the difference between the top 5 one year bonds is not that great and would not affect the overall balance between cash and shares. Further analysis assuming start dates throughout the month shows the same risk of loss with shares. Any day start: 23.82% end lower. First of month start: 23.96% end lower. Over the 21 years from January 1995 to January 2016 the overall return for shares is 6.0% per year compound. For active cash the overall return is 5.0% per year compound. The 1.0% difference is significantly lower than the 3%-8% often quoted for the so-called ‘risk premium’ of investing in shares. On those occasions when shares win the gain is more than the occasions on which cash wins. Overall for the 192 five-year periods when shares beat cash they make an average return of 10.4% a year while cash when a winner makes just 5.5%. But of course when shares lose they can also lose money, as the graph shows. It also illustrates that it take a good couple of years from shares to recover from a serious fall. These falls should not be seen as exceptional – they are quite common. In the 109 periods when cash beats shares investors had to wait an average of 23 months (median 19 months) before an investment in shares would again win. And in the 46 periods when shares produced a negative return it took as much as 42 months and as little as one period for that to be reversed. An average of 19.7 months (median 19.5). So when shares fail to perform there may be a long wait before investing in them is advisable again. But all that speaks to is when judgement might be exercised in share investments. This research is not about that. It is a comparison of using two simple rules – choose a low cost tracker vs use one year active cash. If the interest on cash had been taxed at the current basic rate then over five years the figures are closer but the balance is still in favour of cash. Shares win in 47% (91) of the 192 periods, cash wins in 53% (101). For higher rate taxpayers the calculation is more difficult as tax would also be due on dividends which would affect the comparison. Data to do that calculation is not available and is not done. Basic rate tax is not a consideration for cash interest on ISAs or cash in pension funds as no tax is charged on it. Note that the figures used here are not the rates for ISAs or for funds which can be SIPPed which may be different from those used. Such rates are not available historically over this period. Looking ahead from 6 April 2016 the Government estimates that 95% of cash savers do not pay tax on the interest because the first £1000 of interest earned is tax free (first £500 for higher rate taxpayers). So comparing untaxed cash returns with dividends is fair for the future. Active cash means taking out a one-year bond and then reinvesting the money at the best buy rate when it expires. In the past there would be a delay between the end of the bond and the money being available for reinvestment. Typically that might be up to two weeks. Modelling that is difficult. One approximation is to assume interest rates are 50/52 of the recorded rate. Doing that does not affect the balance of shares vs cash which still wins in 109 out of 192 periods. The money taken by managers from a tracker fund as charges has fallen over the years. Today the charge on the HSBC tracker used is 0.18%. In the past it would have been more. 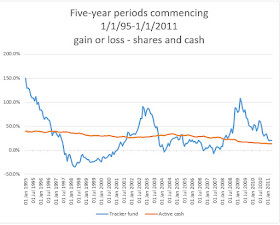 Over the survey period January 1995 to January 2016, five-year investments begun on the first of each month in active cash beat a FTSE100 shares tracker in 57% of 192 periods. Over the survey period January 1995 to January 2016, five-year investments begun on the first of each month in a FTSE 100 tracker ended the period lower than they started in 46 out of 192 periods (24%). That is almost a one in four chance of losing money. Cash, within Financial Services Compensation Scheme limits, will never lose money. The table below gives the results for periods from 5 to 10 years. Cash wins over 5 to 9 years with an even split over ten years. Over longer and shorter periods than that the results are surprising. Shares win over 1, 2, and 3 years; cash and shares win equal times for 4 years. Over periods longer than 10 years cash continues to dominate. Cash wins over investment periods from 11 to 17 years, and among them from 13 to 16 years cash absolutely takes over. Over 14 year periods cash wins in 96% of the periods, shares in just 4%. In periods of 18 to 20 years shares win comprehensively with shares doing better in 100% of the twelve 20 year periods. Sample sizes get smaller as durations lengthen and are therefore less reliable. For investment periods from 1 to 11 years there are always some starting dates when an investment in shares finishes lower than it started. For periods of 1 to 4 years it is always over 25%, peaking at 33% for three year periods. For 11 year periods it is 7% - one in 14. For investment periods from 12 years onwards the tracker always ends higher than it started. These tables are depicted in the graph below. 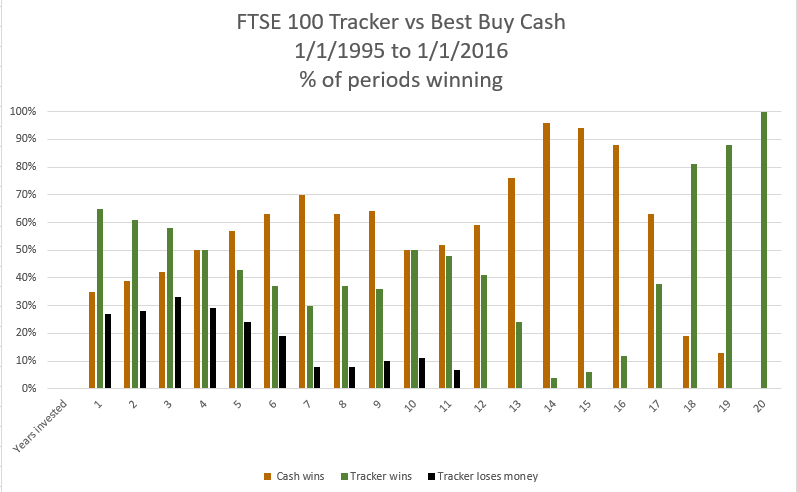 Further analysis of the data shows that for many starting dates from 1 January 1995 investing in shares over any possible period from one year upwards would have produced a lower return than using properly managed best buy cash. That is true for example for the whole of the two years from 1 October 1999 to 1 September 2001 and for four months from 1 October 2007 to 1 January 2008. Money invested on the first of any month on those dates and left for any period from 1 year to the maximum possible 15 or 16 years would have done better in cash than shares. There are fewer comparable times when shares produced a higher return over every possible investment period:- 1 November 2008 to 1 September 2009 is the longest run and two earlier dates are 1 October 2002 and 1 October 2003. Overall for investment periods of five years or more there are 38 starting dates when cash would always have produced a better return but only 24 starting dates when that was true of shares. Adding all the data for all investment periods from one to twenty years cash wins in 55.7% of the 2520 periods and shares in 44.3% of them. Overall cash beat shares. 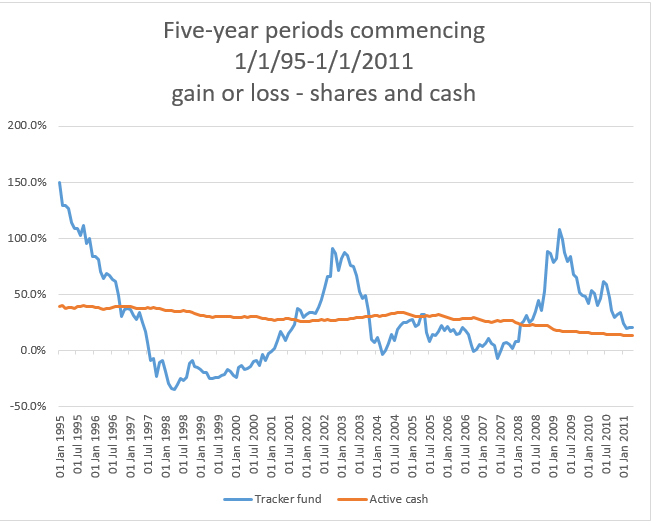 Over the whole 21 year period the tracker out-performs cash. £10,000 invested in a tracker on 1/1/1995 becomes £34,098 by December 2015, a compound growth rate of 6.0% a year. Cash achieves nearly £6000 less finishing at £28,105, a compound growth rate of 5.0%. But the low difference between the risk free cash and the risky shares is striking. Bodie (Financial Analysts Journal May-June 1995 pp. 18-22) finds that the risk of investing in shares does not diminish as time invested lengthens. The data presented here allow the boundary between cash and shares to be set at around 18 years. Less than that there is a better than evens risk that a shares tracker will produce a lower return than a series of best buy cash accounts. For periods below 12 years there is also a risk that a shares investment will lose money. Overall, for a random date and a random investment period the safer bet is active cash rather than tracker shares. I wanted to use a typical FTSE100 tracker that was not low or high cost and might have been picked by an unskilled investor in 1995 for which data was available. MorningStar provided the HSBC FTSE 100 Index Retail Income which fits that description and is used for this analysis. Other trackers are available of course. The five-year analysis has been repeated using HSBC FTSE 100 Index Retail Accumulation, the Marks & Spencer UK [FTSE] 100 Comp Acc, the HSBC FTSE 250 Index C Acc, and the All Share tracker M&G Index tracker A Acc. The data are not available over the same period and have been taken from 1 March 1998 to 1 April 2016. The results from the FTSE100 trackers are almost identical with the data here. 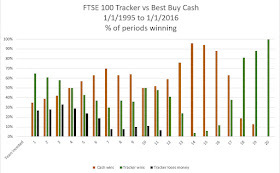 The FTSE All Share tracker shows a similar result with cash beating it in 53% of five-year periods. However, the FTSE 250 tracker has the opposite result with shares beating cash in 65% of periods. The FTSE 250 has shown particular growth recently. However, it would not have been a choice in 1995. Another exercise using just the HSBC Acc and the M&S Acc FTSE 100 trackers from 1 January 1996 (the longest run of data available for the two) showed that over five-year periods the HSBC Acc produced a 57:43 split in favour of cash and the M&S Acc tracker showed 55:45 in favour of cash. Of course with hindsight there will always be trackers which do better and others which would do worse. This research was not designed to do that study. It was designed to compare a typical tracker which would be chosen in 1995 over subsequent five-year periods. At that time the FTSE100 would have been the obvious choices. The figures show that the exact tracker of this type which was used does not affect the overall conclusions. The periods used are not of course independent of one another as they overlap. That raises statistical problems with considering the significance of the differences. But the research was not designed to look for that. It simply says ‘if over the last 21 years I was to stick a pin in a date for an investment and then pick the investment period x, which would give me the better return, active cash or passive tracker?’ Chances are over almost all values of x it would be cash. And for all value of x<12 there is a chance of losing money in a tracker. It also emphasises the importance of when the series starts. That is reflected in the fact that the periods when cash or shares win tend to come not at random but in blocks. The overwhelming advantage of cash over 14 years reflects the dates on which share price collapses and interest rate cuts fall. This research gives different results to every other study of shares vs cash. They universally state that shares do better than cash over every long-term period. The biggest and best known research is published as the annual Barclays Equity Gilt Study (BEGS). Now in its 61st year it now covers periods from 1899. The results of the latest 2016 study are unequivocal in showing cash bottom of investment classes and, by deducting inflation, giving negative real terms returns. My research uses a real tracker – the HSBC FTSE 100 Index Retail Inc – so represents real returns after charges. It was chosen as a typical FTSE tracker for which data were available over a 21 year period. They are rare. A comparison of the returns on the BEGS index and the tracker used in this study from 1995 to 2015 shows that the BEGS index grows 336.80% which is compound growth over the 21 years of 7.3%. My real tracker grows 240.98% which is compound growth of 6.0%. That 1.3% advantage of the BEGS study reflects the difference between a proprietary calculated index without charges and the real world returns on a named FTSE100 tracker. Cash: The BEGS understates the return on cash. For its analyses it uses using a cash surrogate – three month Treasury Bills and for the annual figures uses the return on four successive three-month bills. That data shows compound growth over 21 years from 1995-2015 of 3.9%. The 2015 return on Treasury Bills is 0.45%. In January 2016 the best buy instant access savings account paid 1.65% and the Bank of England average over the 12 months to 1 January 2016 was 0.47%. For comparison the BEGS also uses the interest paid on cash in an instant access postal building society account. That data shows compound growth over 21 years from 1995-2015 of 2.7%. The Nationwide account used since 1998 currently pays interest of just 0.25% a year. Since 1998 the BEGS has also used a now closed Nationwide postal account – Nationwide Invest Direct – which currently pays 0.25%. In past years the rate it has used has been more competitive and for some years was better than the Bank of England recorded average. But since 2008 that has not been the case. This new data show that the rate used by BEGS has consistently been lower than the best buy rates for instant access accounts recorded by MoneyFacts. Both are well in excess of the BEGS rate of 0.25%. Over the 21 years the average rates are BoE 1.59%, BEGS 2.67%, MF best buys 4.51%. Clearly using the MF best buys on instant access would make a significant difference to the returns on cash over the period. This study uses one year bond rates as part of the Active Cash model explained above. They are normally higher than instant access rates. BEGS is correct that over the long run it would be difficult to ascertain either investment charges or real cash data. But by ignoring charges and failing to use a better version of cash the study inevitably exaggerates the real returns on shares and understates the returns on best buy active cash. In general the past in investment is no guide to the future. A fund which has performed well in the past does not help us decide if it will perform well in future. Indeed, costs are the key determiner of which funds do best in the long-term – the lower the cost the better. The FSA (as was) found that poor past performance did tend to persist, but good did not. This study is not bound by that general investment rule. Over the 21 years it covers there has been great variety in both share price changes and cash returns. There is no reason to believe that will be different in the future. The safest assumption for conclusions is that the 21 year study – a period chosen simply on the availability of data – is typical and would be reflected in the future. That is because it is driven by analysis of objective data which does not arise directly from human judgements. In that sense it is more physics than investment and uses the assumption that we occupy no special place or time. What was true will be true. At least that is the safest assumption. Data from the BEGS confirms that the period 1995 to 2015 is not that different from the whole period from 1899 to 2015. For example, over the long run there is a significant percentage of investment periods when cash outperforms shares. The proportion identified is clearly less than the present study due to the overstatement of share returns and the understatement of cash returns. But for example from 1899 to 2015 30% of three year investment periods showed a higher return for cash. From 1995 to 2015 that percentage was 33%. Similarly cash won in 25% of investment periods of five years from 1899-2015 compared with 29% from 1995 to 2015. Those figures do not imply that the period 1995 to 2015 is anything special. Taking the available data from the table below cash outperforms shares in 21% of periods 1899-2015 and 23% 1995-2015. 3. Paul Lewis research. Cash = Active Cash. shares = HSBC FTSE100 tracker.